Kamchatsky Bay is the northernmost bay at the Pacific Kamchatka coast. It is located at the junction between the Kamchatka segment of the Pacific subduction zone and the dextral transform fault of the western Aleutians. The combination of the subduction and collision processes in this region results in the unique set of tectonic controls influencing its geological and geomorphological evolution. The Kamchatka River estuarine area is located on the northern coast of Kamchatsky Bay. The modern Kamchatka River valley, its estuary, and an aggradation marine terrace some 30 km long and up to 5 km wide were formed in this area during the Holocene. A vast area in the rear part of the terrace and in the Stolbovskaya lowlands is now occupied by the peats deposited directly above lacustrine-lagoonal and fluvial facies. These aggradational landforms record traces of tsunamis and vertical coseismic deformations associated with great subduction earthquakes, as well as strike-slip and thrust faulting associated with the collision. The results indicate that the average recurrence interval for major tsunamis in the Kamchatsky Bay is 300 years. The recurrence interval on individual fault zones associated with the collision between the western Aleutian and Kamchatka arcs is a few thousand years for earthquakes of magnitude between 7 and 7.5. For the entire region, the recurrence interval for major crustal earthquakes associated with motions along faults may be equal to a few hundred years, which is comparable with that for subduction-zone earthquakes. Original Russian Text © T.K. Pinegina, A.I. Kozhurin, V.V. 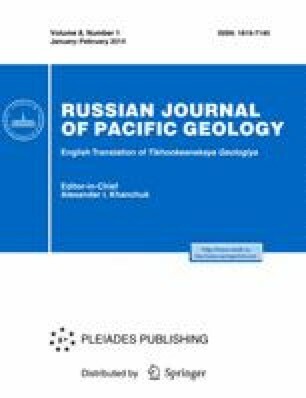 Ponomareva, 2014, published in Tikhookeanskaya Geologiya, 2014, Vol. 33, No. 1, pp. 75–88. SAPB 6.0 program and documentation: http://calib.qub.ac.uk/cahb.